Learn Guitar Chords - Where to Start? There are many things to do if you’re just starting out and you want to call yourself a guitarist somewhere along the way (having a Fender strat or other cool vintage guitar is not enough). One of these things is to learn guitar chords. This is a no-brainer. Every guitarist has to be familiar with at least the basic ones. Fortunately for you, if you’re a beginner, basic guitar chords are simple to play, so you should be able to have some fun with them in a very little amount of time, so let’s get to work. 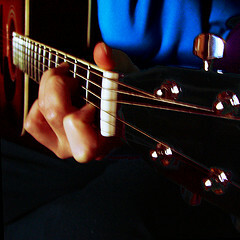 Guitar chords are usually represented by chord diagrams/charts. (You can subscribe to my email updates and receive charts of 101 basic guitar chords for free.) So what you need to do first is to study on how to read these guitar chord diagrams. To describe this to you, the guitar chord diagram has six vertical or horizontal lines (depending on the design) that represent the six strings. And the other lines indicate frets except for the first line which is the nut of the guitar. You can actually find these guitar chord diagrams in any song book or song hits usually located at the back portion. The dots, that are also found in the diagram instruct you on what fret and string to place your fingertips on. The dots on fret “0” tell you to play the open string, which means the string is strummed without being fingered on the fretboard. There are also diagrams that show numbers on the dots that indicate what finger to use in pressing a string. So number one (1) is for the index finger, two (2) is for the middle finger, three (3) is for the ring finger and lastly four (4) is for the pinkie finger. As soon as you get used to interpreting guitar chord diagrams, it will be fun for you to start learning as well as playing the five basic chords that are much easier than all the other chords that you will be learning next. The very first basic chord patterns that you have to learn are the C, A, G, E and D major guitar chords. Once again, these are the most basic easy chords that you will encounter and can do. These chords can help in building the strength and endurance in your fingers especially when changing chords as you play along. This makes them a perfect starting point for your future gutter mastery. So learn guitar chords right now and don’t waste any time. Do you have any beginner tips of your own on how to learn guitar chords in no time?